1920; The eruption of 1919 was the greatest disaster generated by the activity of Mount Kelud in the 20th century. The eruption occurred at midnight between the 19th and 20th of May 1919 marked by a loud banging sound even heard in Kalimantan. 2007; The eruption in 2007 was considered “distorted” from Kelud’s basic behavior because the phreatic eruption (leleran with small eruptions) was not explosive as previous eruptions. In addition, this eruption produces a dome-shaped lava plug that causes the “lost” crater lake. Kelud eruption 2014 is considered more powerful than in 1990. although it only lasted no more than two days and took 4 casualties due to follow-up events, not a direct result of the eruption. 1. Semi-magmatic eruption is a phreatic eruption that occurs due to evaporation of the crater lake water that seeps through the crack at the bottom of the crater which simultaneously then exhaled onto the surface. This type of eruption generally initiated the activity of Mount Kelud especially trigger the occurrence of magmatic eruption. 2. Magmatic eruption is an eruption that produces new volcanic spices of lava, pyroclastic fall, and pyroclastic flow. Magmatic eruptions that occur are generally explosive influenced the addition of volcanic gas content along with increased energy eruption, especially heat energy. Kelud mountain (1731 m) is the product of the collision process between the Indo-Australian plate that plunges down the Asian plate precisely in the south of Java. As a young volcano that grows in the days of Kwarter Muda (Holosen), Kelud volcano is one of volcanoes in a series of volcanoes that grow and develop within the Blitar Sub Zone of the Solo Zone, starting from the southern part of central Java (Lawu Mountain) to Java the eastern (Raung mountain), which is bounded by the Southern Highlands fault escape. The development of this young volcano is very limited, it is visible from low volcano cones, irregular peaks, sharp and steep. 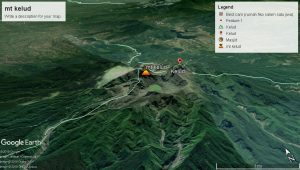 The circumstances of these peaks are caused by the very destructive nature of the eruption accompanied by the growth of lava plugs such as the peak of Sumbing, Gajahmungkur and Kelud peak. In morphology, Mount Kelud can be divided into 5 units of morphology (A.Djumarma, 1991) namely: Peak and Crater morphology units; The Morphological Unit of the Volcano Body; Side Cone Morphology Unit; The Morphology Unit of the Feet and Plains and Mountains of Morphological Units is approximately. Morphological Unit Peak and crater has a height above 1000 m above sea level is composed by lava flows, lava domes, and pyroclastic rocks; irregular morphological forms, small hills with steep cliffs with slope slopes greater than 40, and flow patterns present in this morphological unit are radial flow patterns. The Morphological Unit of the Volcano Body lies at an altitude between 600 – 1000 m asl, composed of pyroclastic rocks of flow, fall and lava sediment. The slope of the slope between (5 – 20), as well as the growing flow pattern is a radial – parallel pattern. Unit of Conical Morphology The side consisting of Umbuk hill (1014 m) to the southwest, Pisang hill (865 m) to the south and Kramasan hill (944 m) south-east of G.Kelud slope. This unit is composed of lava flows, pyroclastic flows and lava domes. This morphological unit has a slope slope greater than 20. The foot and plain morphology unit has a height of less than 600 m above sea level, a slope of less than 5 and a parallel-braided flow pattern, its lithology composed of lava deposits and pyroclastic fall.